Amberjack inhabit the deep waters of the Gulf of Mexico and are “angry” fish. They fight hard and are a prized trophy for any angler. If asked to describe the feisty personality of the highly sought after Amberjack, a crusty old veteran offshore fisherman was heard saying, “Find out for yourself – hook your line to a train, hold on tight and let it take off. Just ensure it is a really big and really fast locomotive.” It has also been said that a lifetime of fighting amberjacks will lengthen your arms by several inches! Of course like most fishing tales, there’s no proven evidence to back this theory, but one day of battling these offshore brawlers will most likely leave your shoulders joints and arms hurting. 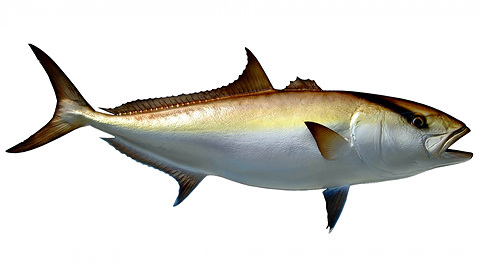 The greater Amberjack is an “angry” fighter that will try to wrench your hands from your arms, your arms from your shoulders, your shoulders from the rest of you and the rest of you from the boat, Yes this species will not go down (or come up) easily. In addition of its fighting spirit, the Amberjack gets BIG, so, all you iron pumping boys and girls, put down the protein shakes and pick up a rod instead and prepare for a new type of workout. Amberjacks are creatures of structure and the hundreds of wrecks and crevasses dotting the bottom of the Gulf are welcome havens for the big jacks. They will weave in and around the structure, persistently looking for a meal. In most cases they travel in small groups, so if you hook one, chances are there’s more to catch. A mature Amberjack typically weighs in between 60 – 80 pounds, while a trophy can weigh over 100 pounds. They are found along the continental shelf in waters as deep as 200 ft. They occupy the Gulf of Mexico waters and are a prize catch by most anglers. So the bottom line is that what the Amberjack lacks in long runs it easily makes up for with its super strength and tenacious fight. Amberjacks have beautiful gold and purple colors. They are found in ocean water on and around wrecks. Amberjacks are extremely difficult to get off the bottom when hooked and will give even heavy tackle a test of strength and endurance.